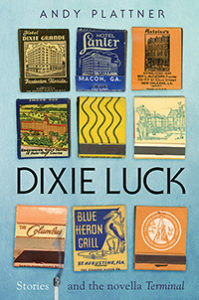 Andy Plattner’s collection, Dixie Luck, is a stirring read right out of the gate, full of finely crafted short stories, as well as the novella Terminal, winner of the Faulkner Society’s 2016 Gold Medal for Best Novella. Plattner – a former horse-racing journalist – also teaches English and creative writing at universities throughout the south, including Emory College of Arts and Sciences and the University of Southern Mississippi. Plattner’s work has won multiple awards. His novel Offerings from a Rust Belt Jockey (2014), won the Castleton-Lyons Book Award as well as Dzanc Books’ Mid-Career Novel Award. His first short story collection Winter Money (1996) was awarded the University of Georgia’s Flannery O’Connor Award. Plattner’s characters are quiet and thoughtful, albeit somewhat lost. There are men struggling to find or reclaim identities, men who have loved and lost, men who have become estranged from their families and are trying to make their own way in the world. Plattner’s women are equally adrift, searching just as hard in their own ways to find peace or resolution in their relationships and their place in the world. The tragedy is that none of these characters ever seem to attain their heart’s desire, but the charm is that they all keep moving, keep hoping for that next big break. Some stories follow a traditional arc. A protagonist is faced with a challenge or issue, they deal with it as best they can, and the reader follows this journey, piecing together the picture of a fractured life and the attempts of the protagonist to fix things or to hold things together at any cost. In “Hot Springs,” a man named Ace runs into an old flame who once stole three thousand dollars from him – winnings from a particularly successful bet. This chance meeting sets him off balance and he starts to question everything, from his wandering life, to his new girl Denice whom he knows “just well enough,” to the motel rooms in which he chooses to live that cover all his basic needs, yet “when it was time to go, there wasn’t a lot to hold you there.” Until this point he had thought himself content, comfortable with the status quo, but now he must come to terms with the person his drifting has allowed him to become, and whether the price of a little ambition will pay off in the long run. Other stories are much more brief, a quick, intimate glance into decidedly un-simple lives. “Prodigy” is a beautifully heartbreaking example of this latter style. It tells the story of a lonely man whose much younger girlfriend has just left him. An item she has left behind – an audio player from a tour they took at Graceland that she forgot to return – holds more significance to him than an actual goodbye letter. He remembers what he so cavalierly said about Elvis’s old home, that it was an “American-style celebration of loneliness.” His reminiscences eventually lead him to recall another important relationship in his life, and in a few short paragraphs it is revealed exactly from whom he learned to relate to other people, and just how well he learned. The novella Terminal completes the collection. This lovely, well-paced work follows Leo and Karen, ex husband and wife, who have reunited in order to take advantage of some insider information Karen has about a very important race. Terminal offers the same thrills and intrigue one finds in the best heist stories: the intricate planning, the sense of urgency and fear, and the longing for things one can’t or shouldn’t have: in this case, both the prize and their lost relationship. In between the planning and strategizing sessions come sweet interludes where Karen shows Leo around her new city of New Orleans. She takes him to her favorite lunch spots, they ride the trolley and enjoy the views. They are very comfortable together, which is why Karen trusted Leo enough to bring him in on this opportunity. The characters in Plattner’s stories are marvelously complex, and in that complexity they are relatable. Life for these characters is not easy, and they have no simple solutions to the ongoing turmoils of their lives. But his characters do learn and grow, not always in the most healthy directions, but they evolve, which makes following their journeys incredibly satisfying.